Every year hundreds of enthusiastic researchers head to the woods, gear in tow, carrying cameras, tents, and various baiting strategies. They enter the woods with one goal in mind: that of finding Bigfoot. The goal of discovery in and of itself is a self-sacrificing cause, often costing the researcher time and money. What drives some of these men and women to do what they do? For some it is the possibility of a new species being discovered, studied, cataloged, and written about. For others, it is to find answers to their own personal experiences. This would be the discovery of the century if a researcher could find and prove this creature exists. There are, however, researchers who practice unethical and potentially dangerous practices while using these Bigfoot baiting techniques, such as the use of menstruating women or menstruation pads, children and gifts of food. The ethical researcher should use environmentally friendly alternatives such as purchased pheromones or cotton shirts, remove children from the field until they are educated, and take a responsible approach to food gifting. Some Bigfoot researchers believe there is a connection between women’s menstruation and pheromone and that these pheromones will attract Bigfoot. They are taking used pads or tampons into the forest and placing them on the forest floor or hanging them in trees with the hope it will lure in the elusive creature, often they leave them behind. The use of women as bait is unethical, especially in the context that the women themselves may be menstruating. By making comments like “I hope one of the girls is menstruating,” the researcher is reducing them to bait instead of treating them as a fellow researcher. This is demeaning and focuses the attention on the male researchers while devaluing their female counterparts. Many of these women contribute greatly to these teams, such as zoologists, biologists, trackers and photographers. They are wives, mothers, sisters and grandmothers, and they should never be treated as a means to an end. 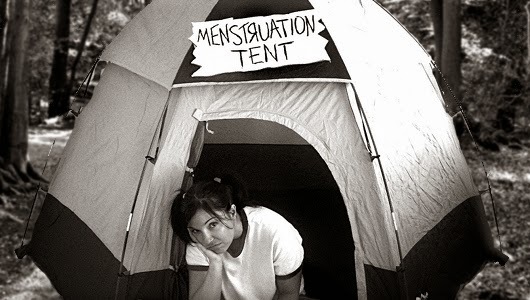 The general use of menstruation pads or tampons is thought to attract Bigfoot through pheromones released during menstruation. The consensus comes from reports such as those found in the Bigfoot Field Researchers Organization database, the largest such organization comprised of scientists and journalists. Report #1090 is one such example, it quotes a woman (name withheld), and her experience as follows: “Around the age of 12 or 13 (I’m 34 now) I went with my parents to Sugerpine Campground in the Sonora/Twain Harte area in California. We were there for two weeks in our 21’ travel trailer, and I was completely bored out of my mind! I also had just started menstruating for the first time while we were in the middle of our trip (mentioning this seems weird, but will make sense later).” She then goes on to explain her encounter with Bigfoot and the fear she felt from the encounter. She concludes her account with “when I mention I started my period for the first time, I believe animals have an uncanny ability to sense and smell those types of things, maybe it caught wind of me and decided to follow and check me out” (BFRO). From this witness report, one can see how the correlation is drawn between menstruating females and Bigfoot, by these researchers. Human females release more pheromones during the ovulation process than are released during menstruation. Humans have three main glands the sweat, sebaceous and apocrine. The apocrine glands are of particular interest to scientists. Professor of psychology Howard C. Hughs writes in his book Sensory Erotica that “In many mammals, apocrine glands are known to function as pheromone factories” (283). One of the areas these glands are concentrated in is the armpit region. Wise Geek, which is a team of researchers, writers and editors, recently published an article by Florence J. Tipton on human pheromones in which she says, “The need to procreate and protect the human species causes females to emit pheromones that generally will be most noticeable during ovulation.” Since human pheromones are released in higher quantities during ovulation, there is no basis for their use in menstruation baiting, as any pheromones would be present in smaller quantities. The practice of menstrual baiting is becoming more popular, and along with this comes greater concerns for safety. This is a dangerous practice that may attract predators to the area, putting the entire team at risk. Wild animals such as black bears, grizzly bears, cougars, and wolves may be attracted to the smell of blood, perceiving it as wounded prey. Therefore, with no field studies on grizzly bears showing how they would respond, there is still a potential risk when using menstruation baiting. Gunther went on to say that the studies included testing on polar bears both captive and free-ranging and found “that free-ranging polar bears detected and consumed food scent samples and used tampons, but ignored non-menstrual human blood and unused tampons. This suggests that polar bears are attracted to odors associated with menstrual blood.” While this may not seem important to some people, at least those in the lower 48 states, it is important to Russian and Alaskan researchers or those in the most Northern areas, and they should most defiantly refrain from the practice. 1. Use pre-moistened, unscented cleaning towelettes. 3. Do not bury tampons, pads and towelettes (pack it in – pack it out). A bear may smell buried tampons or pads and dig them up. By providing bears a small food “reward”, this action may attract bears to other menstruating women. Two separate governments are advising people there is a potential risk. This is not an ethical practice for the conscientious Bigfoot researcher, and there is real danger from predators. Even if women are not used or present, the researcher may be putting themselves or their team members at risk by using menstrual bait such as used pads or tampons. Menstrual baiting should be avoided, in favor of safer and more ethical alternatives. There is no reason to put others at risk, and there are alternatives. Pheromone chips are available online at: BlueNorth.com. This product is a small compressed chip soaked in the pheromones, and then hung in a tree by a string. The chip should be removed and return with the researcher after using it, pack it in, pack it out. By using alternatives the researcher will be removing the blood from the equation and therefore the risk from predators. Since more pheromones are released during ovulation through the armpit region, a tee-shirt worn for a couple of days would serve as a safer alternative as well. The shirt can be taken out into the field, used, and return with the researcher when he or she is finished. Both the pheromone chips and the tee-shirt serve as ethical substitutions to menstrual baiting and will help protect the environment (by eliminating abandoned pads),while keeping the researchers and their teammates safe. This entry was posted on Thursday, May 29th, 2014 at 8:16 am and is filed under Bigfoot, Bigfoot Report, Cryptozoologists, Cryptozoology, Evidence, Footprint Evidence, Pop Culture, Sasquatch. You can follow responses via our RSS 2.0 feed. You can skip to the end and leave a response. Pinging is not allowed. I don’t think I have ever read a bigger load of FEMINAZI CRAP in my life. You will put anything on this web site won’t you. I couldn’t even finish reading this article before I had to go throw up in the bathroom. Hmm. As opposed to what? Not sure how to address this issue. Unethical? Possibly. Reckless? You bet! I live in the heart of grizzly, black bear, cougar and wolf country. I spent nearly half a decade in Alaska under similar circumstances, also. While there may not be “clinical” studies that support the hazards of menstrual blood introduced into the wild, locals don’t need scientists to tell them it’s foolhardy. It has nothing to do with pheromones, and everything to do with the blood scent. There’s nothing sexist about it. A woman shouldn’t go S.C.U.B.A diving in shark waters while menstruating, either. Duh…. I find the whole idea of pheromone baiting rather silly, anyway. Without knowing the physiology of the Creatures, why would one assume they would be attracted to any scent other than their own? Even the chip company cited in this article says they don’t know if they work, or not. The other side of the question is this: If you are baiting an animal that goes out of its way to avoid humans, why would you want to advertise your presence by introducing more human scent? I’ve been hunting and trapping for nearly 6 decades. There are two kinds of bait. 2) something that arouses their curiosity. In my opinion, you would be better off hanging a shiny CD disk 10 feet in the air, than a used tampon. From what I gather, those who have been successful in baiting (or more correctly, ‘gifting’) the Creatures have had the best luck with fruit, and nuts/chips.